Board game groups are fragile things. There are lots of things that can cause a game group to fall apart: problems with the venue, people moving away, personality conflicts, romantic breakups, and so on. But there’s one thing that destroys game groups, alienates new players, and causes people to ignore certain games for the wrong reasons. And I don’t think anyone’s really pinned it down now until now. It’s competitive imbalance. Competitive imbalance happens when you mix casual players with intensely serious players. Casual players play for the social interaction. A casual player will joke with the other players, immerse himself in the game’s theme with some light roleplaying, and generally accept making a possibly suboptimal decision if it means not taking a long time on his turn. A serious player will calculate her options carefully, only focus on the mechanisms of the game relevant for her best possible performance, and only finish a move when she is certain it is the best one she can make. Casual players can annoy serious players in many ways, so many ways that I think I’ll codify them. C1: Talking about subjects other than the game when it’s not his turn (and sometimes when it is). C2: Being so distracted with social matters when it’s not his turn that he has to be reminded that it’s his turn, and then he has to take a long time to figure out his position because he wasn’t paying attention to what the other players did. C3: Over-roleplaying in the game’s theme, and expecting that everyone else do the same. C4: Accidentally making a clearly suboptimal move that inadvertently but clearly throws the game to another player. C5: Intentionally making a clearly suboptimal move to allow a friend or loved one to win. C6: Allowing, asking, or expecting other players to make his moves for him. And of course, serious players can annoy casual players too. S1: Taking an incredibly long time on her turn to crunch through the strategic and tactical possibilities. S2: Getting snappy, sore, or unpleasant at the possibility or reality of losing. S3: Intentionally giving misleading advice to gain a competitive advantage. S5: Convincing all players to gang up on one particular player for her advantage. S6: Being hostile to players new to the game (e.g. not allowing a new player to take back an easily-undone move, or not warning a new player of subtle, easily-missed implications of his actions). Serious players play to get the best possible outcome of the game. Some serious players can adjust their style to play with casual players; some casual players can adjust their style to play with serious players. But I’ve seen a lot of players who can’t, or don’t, change their style. In fact, they don’t even acknowledge that there’s any other valid way to approach a game but their own! Neither side is “wrong” in the way they approach the game. As long as everyone at the table agrees to play seriously or casually (or any of the degrees in between), then the players should have a good time. If everyone at the table is playing overly socially and not really concerned about being competitive at the game, it can be memorable and fun. On the other hand, if everyone at the table is intensely focused at winning the game (perhaps even implicitly and unanimously agreeing to table talk and metagaming being in bounds), then it too can be an amazing time. The problem happens when you have a mix of players, and they don’t recognize that there are others at the table that don’t enjoy their style of play. The casual player in Puerto Rico who keeps picking Craftsman (C4). The serious player who takes over a game of Pandemic (S4). The boyfriend who will only ever trade with his girlfriend in Settlers of Catan (C5). The cousin who ruined childhood games of Monopoly by throwing a temper tantrum (S2). The father who kept winning at Chess, but never showing exactly what his child did wrong (S6). And the thing that amazes me, is that people blame it on the games! Pandemic, and co-op games in general, have developed a reputation for allowing an alpha player to take over, when in reality, you don’t see the problem when playing with a healthy group! There are people who refuse to play Puerto Rico because a new player can so easily throw the game to another player. There are others who will never try a game of Race for the Galaxy or even Dominion because the abilities of a seasoned player are so much greater than a new player, that they do not want to take the lumps of going through a learning curve. So what do we do about this? The best way to avoid competitive imbalance is to make sure that any game you play has players who all agree to similar styles of play. People who play roleplaying games have learned whether they enjoy storytelling or number-crunching in their game (or some specific mixture of the two), and most modern RPGs are clear about whether they’re games with a narrative or a numerical focus. We don’t have to be so specific with board games, but if you’re having a board game night, try to invite people whose play styles are compatible. You don’t have to stick to only competitive or only social players; remember that some competitive players are comfortable shifting gears to play with social players, and vice versa. But be sure you invite people who will enjoy whatever play style you expect for that event. My personal game days are small; I only invite four people at a time. This allows me to have a lot of control over mixing and matching the group for any given day. If I have social players who get flustered with difficult, competitive games, I can pair them with players who can lean back and laugh. If I have competitive players who don’t talk or crack jokes during their games, I can pair them with players who have a similar goal-oriented nature. Neither style is “wrong”, but they can be incompatible. So what if you’re at a convention or a game day that someone else is running, and you have no control over the curation of the players? If your opponents are whomever shows up at your table and you see that there’s a competitive mismatch, try to call it out, as gently and firmly as you can. This one is hard, but you have to do it sometimes. Surprisingly, most people are receptive to your feedback. They usually have the feeling they crossed a boundary, but if no one speaks up, they’ll think it’s no big deal. It is up to the others to ask that player to mind the style that the rest of the table wants to play in. I recently noticed one player in a game giving his girlfriend misleading advice that would help him more than it would help her (S3). I immediately pointed it out. When he joked that he didn’t want me to say that, I asked him politely that if he gave advice, to give real advice that genuinely helped. He’s a smart, friendly guy who is relatively new to gaming, so he quickly understood that trust is important at my table. Help should be genuine help. He continues to be an awesome gamer whom I love to play with. Of course, judgment is important. If the player is a serious player who seems like she could blow a gasket if you pointed out any of his shortcomings, and there seems to be no tactful way out, you may want to grit your teeth and grind through it. Of course, when the game is over, then curate yourself the heck away from him. Games should be fun, and unless you have a personal, Pygmalion-like stake in turning this guy into a fun person to play with, you owe it to yourself to not play with him. Reclamation projects are wonderful, but they are a lot of work, and you should not be expected to do that work if you don’t want to. I wish I’d done this more earlier in my gaming career! This one can be hard for some people, but if you play with strangers frequently, it is an invaluable skill: learn to play with as wide a play style as you can. If you are a casual gamer, start playing the same game repeatedly, and try to get good at it. If you find yourself usually checking texts or the internet when it’s not your turn, and you notice that people are getting annoyed with you, try turning off your phone during a game, or putting it on silent, or charging it at an outlet at the other end of the room. If you are a serious gamer, try to let go a bit. Many people enter the hobby as serious gamers, but then learn to become “stewards” of their tables, and focus their seriousness into making sure everyone understands the rules, possible strategies, and is having as good a time as possible. Be honest with yourself. Be reflective. When you see yourself being too casual or too serious, ask yourself why. If you’re really focused on one side or the other, this will not be easy, and perhaps it will turn out to be more work than it’s worth. In that case, fall back on curation. Try to find a group that matches your play style. Be as honest as you can with them; let them know that you really don’t like competitive games, or that you only play to win and ask they do the same. But be mindful that as long as you can play only a single, narrow style, you will have a harder time finding opponents. Teaching games is not easy. It takes a lot of patience. Players are going to make dumb moves. Sometimes, they realize it, and want to take back that move. Most game groups allow this as long as the next player has not taken her turn. Of course, you’ll have to make a judgment call sometimes. On one hand, if a player is abusing this privilege and taking back a move every time, at some point, you’ll have to ask him to commit. On the other hand, if the move a player missed will clearly lose him the game, you may want to show some mercy and let him make a more optimal move. Remember that what happens at the table will color the player’s perception of the game. If you don’t allow him to take moves back, he will see the game as being overly harsh. If his move allowed another player to win, he might even be afraid of playing again. If you’re teaching the game, see yourself as a ward to the new players, and allow them to experience the game with as much freedom and flexibility as you can. This approach also means the game might take longer than normal. Be sure to make sure you pick a game that fits in your time window. If you have four new players who want to learn Puerto Rico, but you only have 90 minutes, save it for another day and teach them something that would normally take an hour. Seriously, guys. Pandemic has no alpha player problem, but your gaming group might. If one player is consistently taking over the whole game, chances are that player has ruined other, non-co-op games for you as well. It might be time for a tough but necessary conversation. Pandemic has no beta player problem either (you are playing with closed hands, as the rules say, to force potential beta players to speak up, right?). If that new couple is always just showing their hands and checking their phones when it’s not their turns, ask them if they really want to be a part of the group. You may have to institute a no-phone policy at your table. You wouldn’t be the first. Auction games are hard to learn the first time, sure, but that’s not a problem with the game, merely a characteristic. If certain players are flustered that they’re not doing well the first time, maybe they’re overly competitive? Maybe they need a teacher who can guide them through better choices? Maybe they need to be more relaxed during their first play? Deduction games can be fragile. If one player isn’t paying attention and makes the wrong notes, it can ruin the game. Should you recommend that everyone play this game if you have one player who’s a social butterfly and who won’t give the game the attention it deserves? Okay, some games are more robust than others. Some games can better survive a wide mix of play styles. If they’re also fun games, that what makes a great game great. But at a certain point, you can’t blame a car for not being able to float. Get a boat instead. So if you have a group of rowdy kids who like one-upping and trash-talking instead? Go for a social game with possible betrayal, like Cosmic Encounter or The Resistance. You have a quiet couple new to gaming? Show them a gentle Spiel des Jahres winner, like Zooloretto or Dominion. You have a smart, intense group of competitors who play to win? Go big, like with a heavy game with lots of meat to it, like Eclipse or Terra Mystica. So, there’s two tables of games. One is an hour away from finishing. The other is just about to start, and you know that the way they’re going to play is going to bug you. If they have enough people to play, tell them that it’s okay, to go ahead and play. Try to make it clear that you’re not passive-aggressively expecting an invite. If they insist, insist right on back. They don’t control you. If they don’t have enough people to play, that’s a tougher situation. If you know these people well, and if there will be fallout from you declining, and if the game is quick, maybe then this is a bullet you’ll have to take. But remember, no one should force you into a bad time. If there’s another game they can play without you, suggest it. It’s okay once in awhile to swallow your pride and play something you don’t enjoy, but if it is a habit, you may want to look at things again. Gaming should be fun. If everyone else is having more fun than you, maybe there’s another game group more closely aligned with what you enjoy in games? Competitive imbalance is a tough thing. If you’re in an area with few local gamers, you may not have many options; in that case, honesty and forthrightness becomes crucial to a future where you can enjoy yourself. If you’re in an area with many local gamers, you’ll have an easier time. Find gaming groups. Find likeminded people in those gaming groups. At some point, you can stop playing in public places and start playing in curated game nights where the players are more likely to have an aligned play style. At the same time, try to adjust your own play style so you can fit into as many groups as you can. It’s not easy, and it takes time and effort. But the reward is the luxury of never having to deal with a so-called “alpha player” or someone too preoccupied with convivialities to pay attention to the game. It’s worth it. How many women do I get to play with, compared to men? I’ve always felt that there are more men in gaming than women. It’s been something that’s been scratching at me for awhile, like an itch. I met one board game publisher who insisted that women prefer lighter games (would I love to introduce him to some gamers I know! ), and I’ve seen many board games whose art skew towards the male demographic. There seems to be a self-selecting bias here; since many more men play board games than women, allegedly, the games should appeal to those men. But how true is that premise? Are there really more men who play games than women? Well, I can’t speak to video games or RPGs, as I don’t play enough of them to really mean anything. But I do play a lot of board games, and I play those games with a pretty wide variety of people. So at least I can answer the question for myself: what’s the gender breakdown in the people I play games with? So, I did what any self-respecting nerd would do: I started keeping statistics on the gender breakdown of my gaming partners. Here’s what I found. It’s a little depressing at first, but there’s an important detail I have to call out. First: over the course of 37 games and 117 opponents so far this year, I’ve played with 74% men and 26% women. Almost three-quarters of my opponents are men. However, I am a board game designer, and I had noticed that the world of board game design is pretty male-oriented. 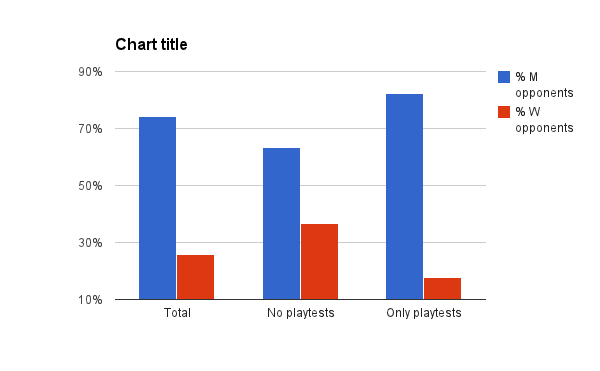 So I split my playtests out, and that was a revealing number. Looking at only my playtests of my games and other designers’ games (20 games, 68 opponents), I’ve played with 82% men and 18% women. And most of those women were not designers themselves. Truthfully, I’m surprised it was even as high as 18%. This is not a statistic I’m crazy about. But things get better when I look at my games without playtests skewing everything towards men. Out of 17 games and 49 opponents, I’ve played with 63% men and 37% women. That’s not quite 50/50, but it’s a lot closer. So what can we make of this? First, keep in mind this is just people I personally play with. This is not meant to be an exhaustive survey with sweeping results. Your results will most likely be different. Second, I don’t really play at game stores or public places. I occasionally play at conventions, but I mainly play at my house or other people’s houses. I’ve found anecdotally (no numbers yet, sorry) that women are more likely to play at private houses than at conventions or game stores. And if you’ve been to many conventions or game stores, you’ll know why. Harassment is very much an issue for women gamers, and you never know who you’re going to play with at a convention. Might be a down-to-earth person. Might be a deranged lunatic. For someone who is statistically more at risk to be assaulted, I can see how this would be a turn-off. Game stores are even worse. I used to run a group at a newly-opened game store. Its ambiance descended into that of a boys’ middle school locker room pretty quickly. Most game stores I’ve been to are exactly the same. Kids buy lots of games, so they run the shop (sometimes literally – some of the loudest, most annoying kids were the ones behind the counter). It’s a pretty unpleasant environment for anyone who thinks of himself or herself as an adult, let alone a woman who has to keep hearing the kids’ misogynistic taunts. So I run a gaming group with vetted invitees out of my own apartment. It’s a much safer, more tranquil environment. I wonder how much different my numbers would have been 10 years ago, when I was playing mostly at game stores and conventions. What can we do to change things? (And yes, I want to change things; I don’t think the board game business should be alienating people simply because they’re the “wrong gender.”) All I can do is try to provide a quiet, safe environment for my women friends. I’d like to make games I design appeal to all genders, but I am not a publisher, and these decisions are usually not in my hands; publishers who offer me a contract have final say over a game’s presentation and art. No Girls Allowed – A fantastic piece on Polygon about the video game industry’s insistence on marketing to males. Women and Gaming Preliminary Research Report – A promising bit of research by Dr. Erin C. Davis polling women gamers, primarily board gamers. It’s preliminary, so the sample sizes are small. I’m very eager to see the report with more women polled. Already there are some fascinating results, especially the section on women reporting on balancing gaming with their perceived responsibilities (pp. 8-9). I’m going to back up for a moment and talk about gaming in general, not just board games. Heather and I show up at the occasional game convention. We had one a couple of weeks ago, and we have a couple of cons coming up next week. A game convention is an event that usually takes the space of a weekend, and it’s usually held in a hotel. * Roleplaying games. These are games in which players sit around a table and come up with a story. Each player takes up the role of one of the story’s characters. Most roleplaying games requre one player to act as referee or “gamemaster” (GM). The GM understands the structure of the entire story (or “adventure,” as it’s more commonly called), and can surprise players by throwing in a shock twist. The GM will also play the role of any character not handled by the players. RPGs are usually not competitive, in the sense that one player is trying to beat the others, or the GM is trying to beat the players. Rather, the usual case is that the players are trying to survive the adventure as a team, and the GM is there to provide tension and challenge, among other things. You might know of Dungeons & Dragons, the first roleplaying game. That game is alive and well after all these years, but other RPGs are quite popular. Amusingly enough, there’s a division between mainstream RPGs like D&D and smaller “indie” games like Dogs in the Vineyard and Burning Wheel, with the latter games offering more innovative, refined mechanics. It’s very similar to the Euro-American board game split, with old school butting up against new school. * Board games. My bread-and-butter. You’ll find all sorts of games here, but it seems that the more thematic games with the American aesthetic are more popular at game conventions.. I think there are two possible reasons for this. First, many roleplayers prefer strongly-themed games, based on my admittedly unscientific perception. Part of roleplaying is immersing yourself in a story, and while board games are not as good at narratives as RPGs, I think a player who enjoys immersiveness will be more at home in a game which has a strong, solid theme. Second, roleplayers at cons play their games in fairly intense 4-hour blocks. It’s easier to follow that with a light, silly 30-minute game than a strategic 2-hour brainburner. * LARPs. These are Live Action Roleplaying Games. They’re like the tabletop roleplaying games I mentioned before, but in these, the participants actually dress in costume and act their character out. Kind of like the difference between someone who reads Civil War books and someone who participates in Civil War re-enactments. * Computer games. Most people will find these familiar. You’ll mainly see the standard first-person shooters here like Counterstrike, though I’ve seen casual games like Zuma and Peggle too. * Console games. These are your Xbox, Wii, and Playstation 3 games. There’s a few differences in the mindset between PC and console games, but that gap seems to have narrowed in the past few years as consoles have matched and exceeded the technical level of your average PC. Ten years ago, PC games were the center of innovation. Nowadays, franchises like Rock Band and Khatamari make me miss having a console. I mention all this because it’s pretty dizzying to see the wide array of options you have at a game convention. Also, some cons specialize in one kind of gaming over another. First I’ll mention Ubercon. This is a special con for Heather and me, because it was our first one. Ubercon is a standard small-to-medium-sized game convention, with a wide array of all of the above game options. I used to run the board game track with my friend Andrew, and Heather used to be a registration desk zombie. We don’t have the time to volunteer that kind of time anymore, but we still show up for mad gaming. Tomorrow is Thanksnerding, a Thanksgiving event held by the good folks at nerdnyc. Gaming will be pretty light over there. They tend to favor indie RPGs (aren’t you glad you read all of the above so you know what I mean?) over board games, but I’m slowly pulling some of them over to my side. Don’t tell them I said that though, I want them to continue to feel safe! * It’s all board games. Nothing against the other kinds of gaming, but it’s nice to see board games not be shunted to the side or considered just a break in between RPG slots. If you’re here, you’re hear for board gaming. * There’s a massive library of old, out-of-print, and hard-to-find games. It’s excruciatingly difficult to find games of Outpost, McMulti, Big City, or any other game that can fetch a few hundred bucks on eBay. * I get to play all the newest games. And I mean newest. Last month was Essen Spiele, the largest board game exhibition in the world. It’s held in Germany, and there are a lot of highly-anticipated titles released there. * Lots of publishers are there, and in fact, I’ll be pitching Prolix to someone while I’m there. Keep your fingers crossed! For the record, here are my top 5 must-plays next weekend. When I started boardgaming seriously back in 2002 or so, I wanted to be the kind of person who liked and played all kinds of games. Sadly, that just didn’t happen. You might think that a board game is a board game, so what’s the difference? But there are so many aesthetic options a designer can choose, that there’s now a dizzying array of board game experiences out there. Now, by “aesthetic options,” I’m not just talking about what color the board is, or whether the art is cartoony or mature. Play styles are all different. Some games are aggressive, others are contemplative, and still others are silly. Some games require you to quickly change your plans, based on your opponents’ recent actions and in-game events. Others challenge you to think many turns ahead, planning for the future. I don’t think there’s any board game genre that’s done more to widen this palette of options than the Euro. Some time in 2004, I started figuring out that I wasn’t someone who liked to play any kind of game. I like Euros, and other genres really didn’t do it for me. Lack of direct conflict. In a Euro, you usually can’t directly attack another player. If one of your opponents plays a card, you can’t play another card to cancel it. If one of your players constructs a building, you can’t knock it down. Bland themes. Most Euros sound really bland, if you just describe the theme. The Settlers of Catan is about building faceless towns and cities on a generic, fictional island. Puerto Rico is about creating a shipping industry in the 17th-century Carribean. Are you bored yet? Carcassonne is about constructing the eponymous French city in the middle ages. Agricola is about farming after the Bubonic Plague has passed. For crying out loud, Bohnanza is about bean farming. Can you imagine how hard it is to get a bunch of people to play a game about farming beans? Ingenious mechanics. As tough as it is to sell people on these games because of the dull-sounding themes, everything changes once you actually start playing these games. Settlers suddenly reveals itself to be a tight, compelling game of planning your moves and trading resources with players. Puerto Rico is one of Euro gaming’s crown jewels, with a fantastic role-selection mechanism that forces you to consider your turns very carefully. Are you interested yet? Carcassonne is a gorgeous game that starts with a few tiles on the board, but slowly grows into a gorgeous landscape of colorful tiles and playing pieces. Agricola, one of the new kids on the block, is filled to the brim with deep strategy and incredible replayability. And Bohnanza, that game that no one thinks they want to play, often gets requested again and again, once people play a card game in which you’re not allowed to rearrange your hand; the only way to get undesirable cards out is to trade them with other players. Beautiful bits. Euros usually look and feel luxurious. Think matted cards, solid wooden pawns, and thick tiles. Lush, colorful artwork. A clean, well-written rulebook. There’s attention to the tactile side of the game. A shorter playing time. A “feature-length” Euro usually takes between 60-120 minutes to play. Also, the games are designed to end in a predictable amount of time. I mentioned in the Take-That post that games like Munchkin have a habit of outstaying their welcome, because players can move away from the endgame condition. Munchkin, in particular, ends when a player reaches Level 10… but players can easily lose levels as well as gain them. A Euro will usually move forward, not backwards. In other words, if Munchkin was a Euro, players wouldn’t lose levels. Or, the game would ensure that more players gained levels than lost them. That would guarantee that someone, at some point, is reaching Level 10. The way the game is now, players can keep gaining and dropping and gaining and dropping between Levels 6 and 9, and the game just keeps spiraling around and around. A mix of strategy and chance. Euros have random elements – some even have dice. But you’ll rarely see a “roll and move” mechanism, where a player’s movement (and turn choices) are completely dictated by a die roll. Or if they are, there’s some safety net that guarantees that the player will have some meaningful choice that turn. What’s good about Euros, other than what I’ve mentioned above, is that they’ve done more to redefine the boardgaming aesthetic than any game out there. Board games have changed more in the past 10 years than in any other time in history. The bar is much higher as a result, and one of the reasons I started writing this blog is to try and pick apart some of these new, refined ideals. For example, let’s look at one of the first Euros a lot of us have played: The Settlers of Catan. (What, you don’t know Settlers? Never played? You can download a fantastic tutorial for your Windows computer by Dana Ledet here, and then go here [as “Xplorers”] or here to try it!) It’s an eye-opening experience for a lot of people because of its clean mechanics. People are used to zoning out on other players’ turns, but Settlers keeps you involved because you can get and trade resources on other players’ turns. Also, there are only five resources, so it’s pretty easy to get a handle on what the different resources are worth… though after a few games, it’s quite clear that different combinations have certain powers. Now, Settlers isn’t a perfect game. If you don’t place your opening buildings properly, or if you have incredibly bad dice-fu, you’re going to have a bad game, no matter what you do. Lots of people have sworn the game off after an evening of watching their opponents trade with everyone else. Look at Carcassonne (if you haven’t played, another great Dana Ledet tutorial is here, and you can play it here as “Toulouse”). It’s a game with a great tile-laying mechanic, and the added twist that you can place a “meeple” on different parts of a tile to score it… but since you only have a few of them, you have to manage them well. That’s a game that, once you start including its expansions, starts to take on a nice depth. However, one of the game rules, the “farmer scoring,” was tweaked a couple of times after the game was released. Settlers is 13 years old, and Carcassonne is 8. Since then, gamers’ expectations of game rules have gone up. We don’t want our games to bog down if we get bad dice rolls, like in Settlers. We don’t want fundamental rules to be corrected after we buy the game, like Carcassonne. There are things you could get away with then, that you can’t get away with now. What’s bad about Euros, other than what I’ve mentioned above, is that there’s a “same-ness” that’s been haunting them for a few years now. Oltre Mare is a good example of a fine game that has slipped under the radar because its mechanics just couldn’t lift it past the blandness of its theme. Personally, I don’t see myself designing a game about constructing a castle to please a king, or trading silk to the Medici family, or colonizing some distant, inexplicably uninhabited land. It’s not just the themes that people can find bland. I mentioned that Euros have clean, elegant mechanics. Think of it is a very safe car. It’s a bit like a Volvo: very clean, neat, and safe… but not daring, risky, or thrilling. Next week, I’ll get into another genre of games, the Americans, that are a sharp contrast to the Euro. They’re games about theme and conflict. Those games are more like muscle cars. They’re fast, loud, and dangerous. Lots of people don’t like Euros. They want their games to have a strong theme. They want to blow the other players up. They want their pawns to represent their characters. They don’t want to play a game about castle building, or silk trading, or farming, or colonization. Well, they might play a game about colonization, if it means actually battling the other players and the natives for territory. They want the theme to mean something. They don’t want to play a game that’s supposed to be about 17th century feudal Japan, but is really about collecting different tokens. Or a game that is supposed to be about exploring a dangerous cave for treasure, but is really about having more cubes in certain parts of the board than other players. You don’t really get that with a Euro. It’s tough to recall how a certain game played even weeks after the game ended. The games are so smooth and stable, that nothing that extraordinary happens during their play. They’re safe, and a lot of people find them too safe. So, why do I like Euros? I’d love to tell you how I’m a fan of all games, and I’ll play anything as long as it’s fun… but no. I really don’t enjoy playing the American aesthetic. That’s not a judgment on those games, just a stylistic preference. I’ll talk more about that in my American Games post, but for now, I’ll just mention that I prefer Euros. I like Euros because I like to worry about game strategy. I like to make plans, and while I understand that some uncertainty is necessary to make it a game, I find that it’s not as much fun if the uncertainty comes from the other players. Because generally, it’s quicker to react than to act, and if reactions are just as powerful as actions, why bother acting? For instance: we’re playing a game where I have to play a combination of cards in order to get a point. I spend a few turns gathering the combination through some intense maneuvering… but when I try to claim my point, you play a card that cancels my action, and forces me to discard the card. So what happened? I just wasted a bunch of turns, because you happened to have a specific card in your hand. That sort of design aesthetic is completely contrary to the Euro philosophy: that players should always be building and advancing towards the end of the game, and that a player’s ability to push a player away from the end of the game should be severely limited. Not completely removed, though. Let’s look at some examples. Settlers has the infamous Robber Baron. Roll a 7, and you get to place the baron on any hex, blocking it, and you steal someone’s card. It’s nasty, but rarely devastating. You don’t blow up another player’s settlement or city, and you can’t disrupt their road system. In Puerto Rico, there’s a very limited capacity to ship goods for Victory Points. One player can easily block another player from getting these precious spaces, or even force them to discard their goods. But again, you’re not destroying their buildings or killing their “colonists.” You can get in another player’s way, but you can’t smack him. In Carcassonne… ooh, this is a good example. In the base game and first few expansions, once a person has claimed a “feature,” like a city or a road, you can’t ever remove their meeple (pawn) from it. You might be able to push your way into the feature with more powerful meeples, but that takes some pretty careful planning, forethought, and luck. In the most recent expansions, there have been new game mechanisms that let you remove other players’ meeples. In The Princess and the Dragon, you can sic a huge dragon on the other players’ meeples. In The Tower, you can actually snipe them from a tall, eponymous tower. At first, either expansion might seem to make the games more exciting. But they’re like drowning an expensive porterhouse steak in ketchup. The direct conflict gets in the way of the whole fun of putting the meeple down in the first place. I find it more rewarding to defeat someone’s meeple by horning in on their territory with twice the meeple power, than to just pull the right tile to let the dragon dine on meeple meat. I’m sure some will disagree. But I’ve already revealed my bias. Once I do something in a game, I want it to stay, unless something extraordinary happens. That’s the heart of a Euro game. Constant progress, towards the end. A certain degree of security and freedom in planning your actions. I love that. I love the release it gives me. I can’t find it in any other kind of game. Maybe that says more about me than it does the Euro. But it is my blog, after all. I’ll start with a genre that’s easy to play and easy to recognize. A take-that game is a light, chaotic card game where players directly attack one another through cardplay. Take-that games usually feature a lighthearted, humorous theme, and they’re often enjoyed by newcomers to the game hobby, before they become crusty, cynical bastards like me. What’s good about take-that games is that they have a low barrier to entry. The games themselves are usually packaged in tiny tuckboxes, and their rules are often short and easy to learn, with most of the intricate stuff printed straight on the cards. With most take-that games, you can teach people how to play the game by simply telling them how to win, how many cards to draw, how many cards to play, and what the hand limit is. They’ll pick everything else up from the text on the cards. Take-that games almost always have hysterical cards and rules. From “The Kneepads of Allure” in Munchkin, to Pookie the Rabbit in Red Dragon Inn, to the rule in Chez Geek that states that any die roll of 6 during Nookie is Really Good Nookie, and cancels one Sleep card from all other players, the best part of a take-that game is going through all the cards and having a good chuckle. Finally, take-that games are very flexible, so there’s a wide range of themes out there, from swordfighting to escaping an alien ship. What’s bad about a take-that game is that for a lot of gamers, they’re just not a whole lot of fun anymore. I’ll speak for myself. One of the things I love about gaming is spending several turns building up a solid plan for victory. There are some games where I don’t even care if I won. I feel great if I came up with a plan, executed it, and did well. That doesn’t happen in a take-that game. Sure, you can usually plan ahead a little, because you have a hand of cards. But that strategy that took you three turns to execute can probably be wiped out by a single card from your opponent. Too bad, huh? And that’s going to keep happening in the game, with the game leader constantly getting hammered by the other players. The game won’t wheeze to a finish until it gets to a point where one player has the cards to win, and no one has the cards to stop him. This isn’t fun to me for a lot of reasons. First, I feel that the game isn’t decided by clever cardplay, but lucky timing. You didn’t get that winning card mix because you worked for it. You were just in the right place at the right time. It feels cheap. Second, it takes so damn long to get there! Most take-that games drastically overstay their welcome. This is because there’s nothing that moves the game to its end. Take Munchkin, arguably the king of take-that games for the past few years. You win by having your character reach Level 10. But since any character can gain or lose levels, you can go backwards. There’s nothing that forces the game to end. It just drags on and on and on. This is a bit of a sin in modern boardgaming. The best games are engineered to take as long as necessary, and no longer. Who has time for a 15-minute game that can take 1 hour to play, when there are 15-minute games that take 15 minutes? You might recognize some of these gaming problems. You might even be nodding your head, recalling that terrible night your friend/relative/s.o. forced you to play that terrible game. If so, rest assured that that’s not how all board games are. They get better. However, you may never have played these games before. In that case, I’m torn. On one hand, I find these games deeply, fundamentally un-fun. I don’t feel like I can recommend them in good faith. On the other hand, we were all young once. There’s something innocent about these games, a return to basics that I kind of envy. Who am I to tell you to skip a childhood? If you’ve never played these games before, give one a try. I can guarantee that at least one card will give you at least one good belly laugh.